It’s been 30 years since director Ridley Scott made a science-fiction film, so his return to the genre created a lot of excitement. The anticipation was warranted because Scott is a fine craftsman and his early science-fiction efforts, “Alien” and “Blade Runner,” are classics. With “Prometheus,” Scott is back in the “Alien” universe, telling a story that takes place before the events of his original, 1979 movie. Although “Prometheus” is a prequel in the technical sense, one needn’t have seen the other “Alien” movies to enjoy or understand it. Longtime fans of the series should be pleased to know, however, that Scott elevates the material far beyond the schlock of the “Alien Vs. Predator” efforts, bringing the franchise back to its more serious beginnings. The plot centers on Elizabeth Shaw (Noomi Rapace) and Charlie Holloway (Logan Marshall-Green), archeologists who believe they have discovered alien relics that can lead them to the forerunners of the human race. With funding from the massive Weyland Corporation, they travel to a distant moon with a scientific exploration team that includes Weyland executive Meredith Vickers (Charlize Theron) and an android named David (Michael Fassbender). Upon arrival, the team discovers that the moon has indeed hosted beings that have human DNA, but all of them seem to be dead. Before the team can decide what this means, they are exposed to an oily, unknown substance with terrifying side effects. “Prometheus,” which can be viewed in either 2D or 3D, is beautifully shot, and Scott does a fine job recreating the eerie atmosphere that permeated the first “Alien” movie. The cast is also outstanding, with Fassbender in particular turning in a memorable performance. Although an android, David looks exactly like a human being, forcing Fassbender to create physical and mental tics that set the character apart without becoming distracting or campy. Despite the beautiful visuals and strong performances, the movie has faults, most notably that it takes two hours to deliver a story that could have been successfully condensed to 90 minutes. Also, despite the long run time, the movie features dangling plot threads which are sure to eat away at attentive viewers. None of this means “Prometheus” is a flop. It’s still an entertaining movie that should be applauded for reinvigorating the “Alien” franchise. Just don’t go in expecting Scott to recreate his 1979 magic. “Prometheus” is available as part of multiple home video releases, including a four-disc collector’s edition. Extra features vary. Sometimes a movie is so gaudy, over-the-top and downright bad that it seems the filmmakers designed it that way. 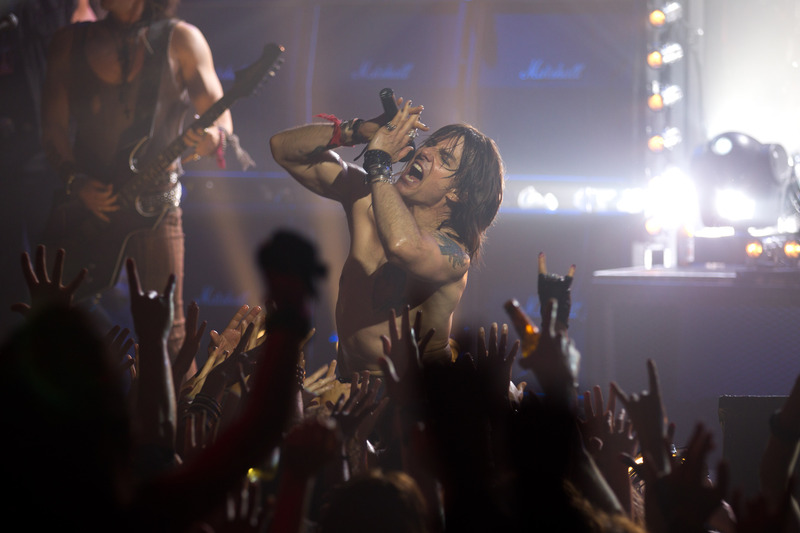 Welcome to “Rock of Ages,” a musical that blends the biggest rock hits of the 1980s with a predictable script and the campiest acting you’ll ever see from A-list stars. As with the Broadway musical that inspired it, the plot of “Rock of Ages” is just an excuse to move from one famous rock song to another. It centers on Sherrie Christian (Julianne Hough), a Tulsa, Oklahoma, singer who travels to Los Angeles in hopes of becoming a star. Rather than rocket to success, she lands a job as a waitress at the Bourbon Room, a Hollywood rock club on the verge of closure due to unpaid bills. It’s a tough gig, but Sherrie is happy because she falls for a handsome co-worker named Drew (Diego Boneta). As the film progresses, it follows the romance between Drew and Sherrie while also detailing the struggles of the Bourbon Room. The club owner (Alec Baldwin) is a true rock ’n’ roller, and he hopes to pay off his debts by staging a concert featuring rock superstar Stacee Jaxx (Tom Cruise). This leads to more obstacles, however, as the Los Angeles mayor’s wife (Catherine Zeta-Jones) launches a church protest against the show. This is pretty cliché stuff, but the heart of the movie lies in frequent breaks that have the cast performing songs ranging from Night Ranger’s “Sister Christian” to Pat Benatar’s “Hit Me With Your Best Shot.” Fans of 1980s music will find a sense of nostalgia in the tunes, and the actors can sing, but none of the performances top those in the original recordings. That means viewers are left with a musical that has a weak plot and so-so soundtrack, a bad combination if ever there’s been one. The strange thing is, one has to believe that director Adam Shankman – who also made 2007’s “Hairspray” – knew he was making a bad movie and decided to celebrate the flaws. To some degree, the unusual strategy works because there’s an odd joy in watching Baldwin and co-star Russell Brand belt out a bad version of REO Speedwagon’s “I Can’t Fight This Feeling.” It’s even more fun to watch Cruise sink into the role of Stacee Jaxx. He attacks the material with gusto, delivering a performance so theatrical that it’s impossible to look away. DVD and Blu-ray extras include an extended cut of the film, a short about the Sunset Strip music scene and a bit about life in the 1980s. “The Raven”: Thriller in which a fictionalized version of writer Edgar Allan Poe (John Cusack) helps track a serial killer who is modeling his crimes after the author’s stories. Luke Evans, Alice Eve and Brendan Gleeson also star. Directed by James McTeigue (“V for Vendetta”). “Whitney” – Season One: The second season of this NBC sitcom will begin airing Oct. 19. If you haven’t seen the first 22 episodes, they’re all included here. Comedian Whitney Cummings stars as a fictionalized version of herself, and the plotting generally centers on her relationship with a live-in boyfriend (Chris D’Elia). Zoe Lister-Jones, Rhea Seehorn, Maulik Pancholy and Dan O’Brien also star. “Jeff Dunham – Minding the Monsters”: Fifth television comedy special from ventriloquist and stand-up comedian Jeff Dunham. The show features many of his favorite characters, including Jose Jalapeno on a Stick and Achmed the Dead Terrorist. It also boasts a spooky, haunted house theme. “E.T. – The Extra-Terrestrial” – Anniversary Edition: Director Steven Spielberg’s 1982 drama about an Earth boy who befriends a stranded alien is making its Blu-ray debut. Henry Thomas and Drew Barrymore star. “Werewolf – The Beast Among Us”: Direct-to-video horror film about a monstrous creature stalking the residents of a 19th century village. Ed Quinn, Stephen Rea and Steven Bauer star. Directed by Louis Morneau (“Joy Ride 2: Dead Ahead”). “The Barrens”: Stephen Moyer stars as a man who takes his family camping in a remote New Jersey forest only to become convinced they are being stalked by the legendary Jersey Devil. Mia Kirshner, Allie McDonald and Shawn Ashmore also star. Directed by Darren Lynn Bousman who made “Saw” II, III and IV. “30 Beats”: Writer-director Alexis Lloyd tells the story of 10 New Yorkers whose lives are changed and connected by a series of sexual encounters. Paz de la Huerta, Justin Kirk, Ben Levin, Lee Pace, Condola Rashad, Thomas Sadoski and Jennifer Tilly star. Eclipse Series 36 – Three Wicked Melodramas from Gainsborough Pictures: The always-solid Criterion Collection has gathered three melodramas produced by British studio Gainsborough Pictures during the 1940s. Included are “The Man in Grey” (1943), “Madonna of the Seven Moons” (1945) and “The Wicked Lady” (1945). “Big Top Scooby-Doo!”: New animated movie featuring Scooby-Doo and the rest of his mystery-solving pals. In this adventure, the gang joins a circus in order to investigate werewolf sightings. “The World Series – History of the Fall Classic”: Documentary film looking at the ins and outs of the World Series. Narrated by Bob Costas.